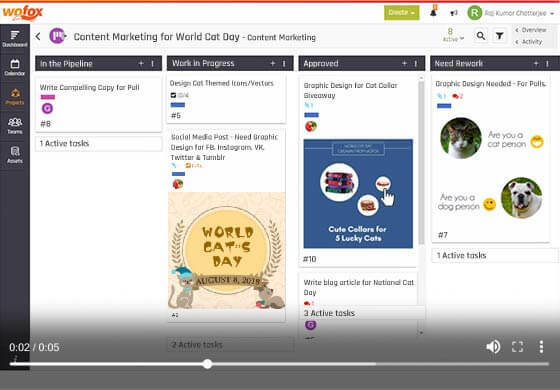 Managing all your visual content creation works through a project management tool simplifies your workflow and saves time. With WoFoxProject, you can manage your projects with real-time feedback, and plan, track workflow and communicate easily with your teammates. Brainstorm, conceptualize and strategize your visual content creation & campaign. Create all your designs, photo arts, GIFs & video stories, all in one place. Collaborate your visual content with your team & clients. Get real-time feedback. Save time, re-use brand content when needed, eliminate unwanted process & easily close project. Create your own custom project workflows and stages (Tasks Lists) that are easy to implement and simple to use. Create your own workflow and statuses to fit your team and project. Move or Copy task lists between projects. Define each stage of a project by setting its status. Add your teammates and clients to collaborate with you on projects. Keep track of all the changes made to project with a real-time feed. Easily find only the things you need so you can spend more time on what matters most. Create a task and assign it to yourself or your team members. See all your tasks for a given day in one view. Break big tasks into smaller checklists items and track progress. Categorize tasks with tags with colored labels and use them to filters. Keep all required files and designs for the task in one place. Give each task a due date to keep track of your deadlines. Move or Copy task between projects and task list. Share ideas and discuss about your tasks in one place without all the email threads. Easily communicate with your teammates about tasks on what needs to be done. Get approvals of your design or task before you move them to completed to minimize re-work and delays. Prefix @ before your teammate’s name to directly notify them about something. Be informed about all the tasks, messages or comments, @mentions, request approval and more. Also, customize how and when you receive notifications. Get a real time snapshot of workspace activity from overview dashboard. Use a combination of filters to get specific data across all projects. Learn about the percentage of overdue, completed and planned tasks in a task list. Keep track of the task completion rate of all the tasks inside your project. Keep track of the completion rate of the entire checklist inside your task.